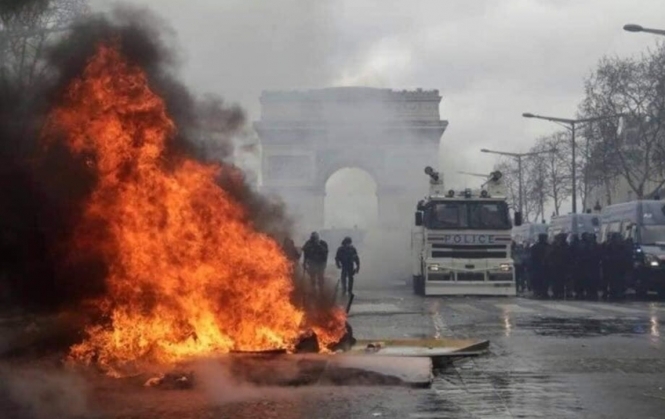 A total 92 people remained in police custody on Monday following more violence at Saturday's gilets jaunes protest on Paris's Champs-Elysée, police have said, with another 97 due to face court in connection with the disorder. According to Interior Minister Christophe Castaner, 1,500 "ultra-violent" activists had infiltrated the 10,000 demonstrators in Paris. According to figures released on Sunday evening by the Paris Public Prosecutor's Office, a total 250 people, including 21 children, were arrested. They vandalised and torched famous Fouquet's brasserie, as well as luxury handbag store Longchamp. A number of other stores, a bank, a chocolatier and several newsstands were also damaged. President Emmanuel Macron called for an end to the disorder. Vowing strong action, he said: "It's over. I insist that this type of scene cannot happen again, especially on this Avenue." His comments came after the government admitted its security measures had been "insufficient" to stem an arson and looting rampage by black-clad anarchists during a gilets jaunes protest along the famous Champs-Elysees in Paris. Police appeared to be overwhelmed as demonstrators ran amok on the avenue, with retailers there saying some 80 shops and businesses were vandalised. Prime Minister Edouard Philippe was due to meet President Macron on Monday to discuss official responses to the latest violence. Le Monde reported that they may consider not allowing further gilets jaunes demonstrations on the Champs-Elysée. The 18th weekend of protests, dubbed an 'ultimatum' by the gilets jaunes, saw 32,300 people take part in protests across France, according to Ministry of Interior figures. A post on the gilets jaunes Facebook page, however, puts their estimate at more than 230,000. Representatives of the movement have called for Interior Minister Christophe Castaner's resignation over the violence, accusing anarchists of hijacking the peaceful weekly demonstrations. Finance Minister Bruno Le Maire was due on Monday to host a meeting with trade and employers groups as well as insurers to discuss the economic impact of the protests, his office said. Last month, he estimated the economic impact would knock 0.2 percentage points off France's economic growth. On Tuesday, Mr Le Maire and Mr Castaner will face questions from two French Senate committees over Saturday's events.